You might get a little confused with your shapes in this town. Salem , a small town in Oconee County in the northeastern corner of the Upstate of South Carolina is actually shaped on equal sides making it a perfect Pentagon.. YET the town’s motto is that Salem is the Diamond of the Upstate. There’s a lot to make you smile in this small region located off the historic Highway 11 road bordering the gorgeous Blue Ridge Mountains. So what is so special about this little town? 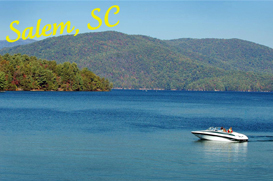 Four words: Lake Jocassee and Lake Keowee, two of the most amazing and pristine large lakes in South Carolina and truly the most clean and desired for everything from boating, to fishing, even scuba diving! And located on these lakes are some of the most prestigious and amazing homes in the region. Celebrities such as Jack Nicklaus, John Elway and Dan Elway are among the many celebrities who have homes at the “Cliff’s” communities including their world class Cliff’s at Keowee exclusive luxury community. Salem prides itself on its lakes but also on its focus on the environment, green living, yet maintaining the family atmosphere that welcomes folks from Georgia to North Carolina. You may pitch a tent and camp lakeside or mountainside, or enjoy the fun cultural events from cruise-ins to festivals. This town may be small but it packs a punch. Homes in this area vary in size, style and price so whatever you want, from mountain to lake to rolling hills with acreage, there’s something for everyone in Salem. If you’re an outdoor enthusiast, whether it is biking, hiking, sailing, fishing or camping, this town is a no brainer for the person wishing to explore all that nature has to offer in the Upstate. Plus with its smaller community schools, government and arts community, there will be no hustle and bustle of a big town. This town is for quiet relaxation and enjoyment. The larger cities of Greenville, Anderson and even Atlanta Georgia are a very short drive away. This is a nature enthusiast’s dream. Mountains to vast lakes, privacy yet affordability, this is the place to relax forever. Welcome to Salem!